SANTA MONICA, CA (August 1, 2017) – Discover the terrifying dangers lurking under the surface when 47 Meters Down swims its way onto Digital HD on September 12 and Blu-ray Combo Pack (plus DVD and Digital HD), DVD and On Demand September 26. 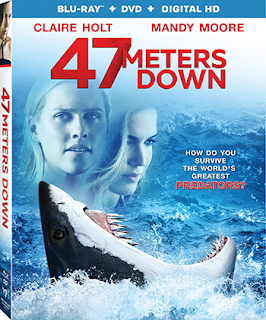 Stuck 47 meters below the ocean surface, Claire Holt (“The Originals”) stars alongside Mandy Moore (“This is Us”) in this must-see underwater thriller. Holt and Moore are joined by star Matthew Modine (The Dark Knight Rises) in this gripping race against time.